Keep punching, Milan. They pay $20 per pint. 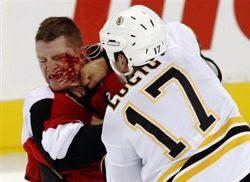 We heard some surprising news from Ottawa today, with reports that Senators' winger Chris Neil is apparently bankrupt. While the case appears to involve a family business and not Neil directly, he's still on the hook to creditors for $2.4 million. Many hockey fans are stunned -- how can a guy who recently signed an $8 million contract find himself in financial trouble? Unfortunately, this sort of story turns out not to be an uncommon one in the league. Despite their high salaries, many players find themselves in severe financial difficulty. After every victory, he digs up center ice to see if anyone hid a toonie in it. If his team ever wins a championship, his plans for his "day with the Cup" involves sitting on a street corner and shaking it at passers-by. His new dental bridge appears to be made out of paper mache, duct tape, and seven of Duncan Keith's old teeth. Every time he goes out to eat, he tries to convince one of the Canadiens forwards to order him something from the kid's menu. His current salary cap hit is negative fourteen million dollars. He walks around looking like he spent five dollars on his haircut, instead of seven dollars like all his teammates. Every time the zamboni slows down, he jumps out and starts trying to squeegee its windshield. On Twitter, Allan Walsh keeps referring to him as "Client Mr. Better-Pay-His-Agent-If-He-Still-Wants-To-Have-Kneecaps". Several weeks ago, he offered to buy Dustin Byfulgien lunch. He's drowning in so much red ink that Ron Maclean immediately breaks into his slow motion Hasselhoff beach sprint every time he sees him. Instead of a playoff beard or playoff moustache, he's currently rocking a playoff GoldenPalace.com forehead tattoo. When the Edmonton Oilers call with a contract offer, he answers the phone. He's started blogging for Hockeybuzz. (Wait, I'm sorry, that was meant for the list of "Signs your favorite player is morally bankrupt"). He's so desperate for money that he's started posing for newspaper covers wearing a skirt. Gary Bettman just legally adopted him. Thanks. Now I'm picturing Ron Maclean shirtless running across the sand. I guess it's no sleep for me again tonight! Awesome post. Quit your day job. Love the Allan Walsh one. Good stuff. One does wonder if this was an instance of guy bankrolling his idiot brothers. How many players have lost their shirt in the construction business? Theo Fleury also did with a concrete coating business. Who writes for the evil Eklund? His gambling history includes betting on the Washington Generals v the Globetrotters, the Brooklyn Brawler, and the San Jose Sharks in the playoffs. "He took Kyle Welllwood out to a fancy restaurant and told him he could order whatever he wanted"
Funny stuff, once again. Especially loved the one with the "tattoo playoff ritual"! Loved the hockeybuzz and Canadiens ones, great stuff as always. "You agreed to give 'a small loan' to Ice Edge on some strange and complicated lease agreement"
Nice work DBG. Loved the Canadien and Oiler points. Buys Byfuglien lunch? That's the first time I've seen you avoid a Kyle Wellwood is fat joke. Once bet Jeff Finger he couldn't get a 14 million dollar deal. How do you pronounce "Byfuglien"?